With the holidays approaching, it's time to get ready for friends and family who will no doubt stop by for joyful celebrations or even overnight visits. This year, as part of your preparations, give some thought to your guests' comfort by installing a heating system that can accommodate a wide range of temperature preferences. It’s going to be a busy holiday season. Cousins are driving in from out of town, and grandparents are staying for at least a week, possibly longer. You want everyone to have a great time, so you’re going all out: you’re cleaning the house, sprucing up the guest rooms and making your home look beautiful. Additionally, you’re pouring over recipes to ensure that every meal not only tastes delicious, but also appeals to your guests’ diverse tastes. In short, you are doing everything within your control to make sure your guests are comfortable. But there’s one thing you may not have considered yet: With so many people under the same roof, and with each person likely favoring a different temperature, is everyone going to be truly comfortable? Having pondered just about everything else, why hadn’t you thought about accommodating your guests’ varying temperature preferences? The reason may be, quite simply, that you didn’t know you could. 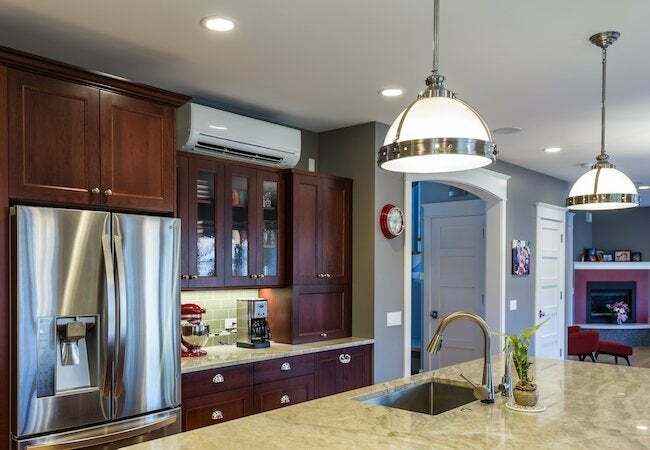 For decades, the average cooling and heating system has taken a one-size-fits-all approach, with one thermostat controlling the temperature of every room in the house. Who knows how many disagreements have arisen in households whose members couldn’t agree on a single temperature—all because of that one limitation? Fortunately, cooling and heating have advanced by leaps and bounds in recent years. Thanks to the zoned systems pioneered by Mitsubishi Electric US, Inc. Cooling & Heating (Mitsubishi Electric), you can put an end to thermostat wars once and for all! 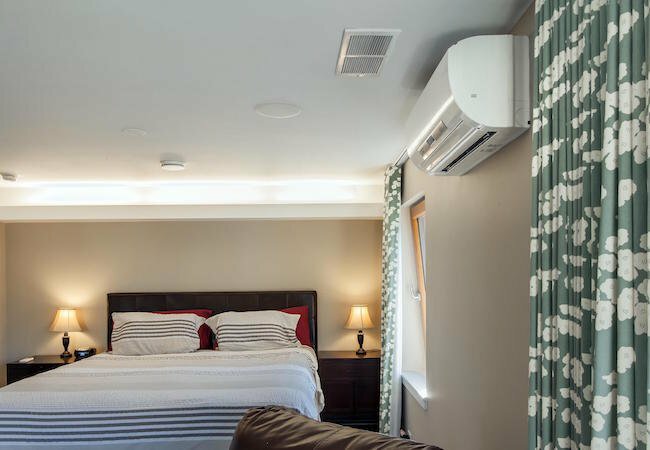 Of all the features Mitsubishi Electric systems deliver, one particular capability could have the greatest impact on the comfort of your holiday guests—zoning. In homes with traditional cooling and heating systems, only some people will be truly comfortable at any given time. Mitsubishi Electric, however, enables you to establish multiple zones. Each zone, whether it comprises of one room, a set of rooms, or an entire floor, can be controlled independently of the others. So, while you’re cooking Thanksgiving dinner or a Christmas feast in the oven-warmed kitchen, you can remain cool by keeping the room’s temperature relatively low. Meanwhile, in the living room, where the grandparents are being entertained by your children, you can set the temperature a few degrees higher. Indeed, everyone can enjoy his or her ideal environment. The ability to select different temperatures in different zones ensures a higher level of comfort, but that’s not all. At a time of year when family finances are often strained, zoning provides another crucial benefit—an energy-saving opportunity. Because traditional systems operate in all-or-nothing fashion, one-zone climate control can’t capitalize on these same opportunities. To have cooling or heating in any room, you must run the system (and pay for the energy consumed) in all rooms, even the unoccupied ones. Imagine if the same principle were applied to a home’s electrical system, and turning on one fixture meant turning on every light in the house. A setup like that would be extremely wasteful, not to mention inconvenient. With zoning, Mitsubishi Electric offers a sensible solution. The precision afforded by Mitsubishi Electric means that you only pay for the climate comfort you need and use. For instance, on New Year’s Day, as the family sleeps late in the bedrooms upstairs, you can set a lower-than-usual temperature for the spaces on the ground floor. After all, if the living room and kitchen are vacant, why spend the money to make them toasty warm? Later on, when household activity moves downstairs, you can cut back on heating the now-empty bedrooms. In this way, Mitsubishi Electric’s systems empower you to eliminate unnecessary energy consumption and, in the process, reduce your monthly utility bills. Room-by-room system management may seem straightforward and logical, but only zoning makes it possible. In the future, you may wonder how you ever lived without it! Whereas traditional HVAC is inflexible, Mitsubishi Electric gives you virtually limitless options. If you choose, you can program the system to run on a customized schedule, making savings automatic and manual adjustments unnecessary. Of course, because schedules are prone to change—especially during the holiday season—the Mitsubishi Electric system easily accommodates changes of plan. Thanks to its kumo cloud™ app, you can configure the thermostat in your home from anywhere, via a computer or mobile device. Heading home from a chilly afternoon at the ice rink? Open the kumo cloud app on your smartphone and turn up the heat in advance of your arrival. With Mitsubishi Electric, you’re in complete control of creating a comfortable environment for you and your guests.